What will your Haiti relief donation go toward? Agencies are asking for moslty monetary donations for relief efforts in Haiti, for many are still assessing the country's needs. (CNN) -- The list of agencies helping with relief efforts in Haiti keeps growing. Their no. 1 need? Money. But how will they be using your donations? We compiled a list of just some of the organizations and asked them. These resources include the highest-rated charities by CharityNavigator.org, an independent nonprofit organization that evaluates charity groups based on effectiveness and financial stability. These sites are vetted by CNN journalists for credibility. The agency supports grass-roots, community-based organizations in remote locations whose needs are not always met by larger organizations. To donate to its Haiti relief efforts, go to ajws.org/haitiearthquake/ or mail a check to 45 W. 36th St., 11th Floor, New York, NY 10018. Make checks out to American Jewish World Service, and in the memo section write "Haiti Earthquake Relief Fund." You may also call 1-800-889-7146 or 212-792-2900. The group will use the funds for immediate needs, such as psychological and social support; health services and education on hygiene and disease prevention; mobilizing volunteers in Haiti to help with rescue and aid distribution; and aiding the Haitian Dominican community, who can coordinate with the Dominican government for greater support; in addition to long-term rebuilding plans. The American Red Cross' primary focus during the initial response of an emergency is food, shelter and meeting other basic needs. To donate: Go to RedCross.org, hit "donate now" button at top and then choose International Response Fund. You also can text "Haiti" to 90999 to donate $10 to the International Response Fund. The money will go directly to relief efforts in Haiti. Or call 1-800-Red-Cross. This humanitarian organization's focus is fighting global poverty, specifically by empowering women and girls. To donate to the Haiti relief fund, go to Care.org or call 1-800-521-CARE. Money will go toward food, water and sanitation, shelter and emergency health response. Catholic Relief Services is an aid agency that works with emergency relief, micro-finance, AIDS/HIV relief, agriculture, water and sanitation, among other projects in countries around the world. To donate, go to crs.org, or call 1-877-HELP-CRS. You also can text RELIEF to 30644. You will receive a text message back with instructions on how to donate. You can send a check to Catholic Relief Services, P.O. Box 17090, Baltimore, MD 21203-7090. Write "Haiti earthquake" in memo area. The money will go toward immediate needs, including water, food, hygiene kits, bedding and basic cooking utensils. The aid agency focuses on extreme poverty. It targets the root causes of poverty through programs in education, health, water needs, HIV/AIDS, microfinance and emergency responses. To donate, go to concernusa.org or call 212-557-8000. You can also mail a check or money order to Concern Worldwide U.S. Inc., 104 E. 40th St., Suite 903, New York, NY 10016. Indicate that it is for Haiti, or write "Concern Haiti Appeal" on the memo line. Money will go into a specific Haiti emergency fund, which includes supplying water, food, shelter, medical supplies and lasting reconstruction. A humanitarian agency that helps communities rebuild after disasters and empowers people by offering lasting solutions that fight poverty and disease worldwide. To donate, go to er-d.org or mail a check to Episcopal Relief & Development, P.O. Box 7058 Merrifield, VA 22116-7058 and write "Haiti" on the memo line. To donate by phone, call 1-800-334-7626, ext. 5129. The agency is working with partners in Port-au-Prince and other affected areas to meet immediate needs such as food, water, shelter and medical care. It is also assessing needs and developing plans for a long-term recovery program. The agency delivers food, medical supplies and other goods to the poor. To donate to its Haiti relief efforts, go to foodforthepoor.org, or call 1-800-487-1158. For those living in South Florida, bring donated items to the Food for the Poor headquarters office at 6401 Lyons Road, Coconut Creek, FL 33073. The charity will accept canned fish, canned meat, canned milk, canned baby formula and bottled water. Monetary donations will go toward purchasing food and supplies as well as shipping costs. The agency is a global network of first-responders, humanitarian relief workers, health care providers, educators, community leaders, activists and volunteers. To donate to its Haiti relief efforts, go to theIRC.org, or call 1-877-REFUGEE. You can also mail a check to International Rescue Committee, 122 E. 42nd St., New York, NY 10168. Or text HAITI to 25282 to donate $5 to the IRC. Money will be used for repairing and supplying health clinics, providing clean water and sanitation, and implementing programs for traumatized children and youth; helping manage a database to register orphans and separated children and trace their relatives; and protecting women and girls who may be exposed to sexual violence. The nonprofit organizes volunteer teams to provide medical and non-medical assistance to victims of disasters and poverty. To donate, go to irteams.org, or call 619-284-7979. Checks can be made out to International Relief Teams, 4560 Alvarado Canyon Road, Suite 2G, San Diego, CA 92120-4309. The money will be used for medical supplies, medicine and other relief supplies, and to support volunteers heading to Haiti for relief efforts. The Christian-based humanitarian relief agency focuses on giving aid to children and their families in Haiti. To donate, go to loveachild.com, or call 1-800-645-4868. You can mail a check to P.O. Box 30744 Tampa, FL 33630-3744. Write "Haiti Earthquake" or "where most needed" on the memo line. Monetary donations will be used for food, clothing, shelter, schools and medical needs, among other services. The Christian global health organization sends volunteer medical teams and supplies to those in the midst of disaster or poverty. Monetary donations will go to supporting the medical teams being sent to Haiti and to the cost of shipping the medical supplies donated by corporations. Donate by going to medicalteams.org and clicking on the "Donate Now" button, call 1-800-959-HEAL (4325), or send a check to Medical Teams International, P.O. Box 10, Portland, OR 97207. The humanitarian organization delivers medical care to people caught in crisis. Donations to its Haiti relief efforts will go toward repairing the obstetrics and trauma hospitals in Haiti that were damaged in the earthquake. They also will go to transporting an additional 70 doctors and medical supplies to the island in an effort to set up makeshift emergency medical response centers. To donate, go to doctorswithoutborders.org, or call 1-888-392-0392. The organization provides humanitarian assistance and economic opportunities in the world's toughest places, specifically those dealing with poverty, conflict and instability. To donate, go to MercyCorps.org. Money will go toward immediate humanitarian needs in Haiti, which may include food, water and temporary shelter. The international relief agency provides funding for reconstruction and development aid to communities that have experienced disasters, disease and poverty. For its Haiti relief efforts, the agency plans to use donations for health care materials, water purification supplies and food supplements. To donate, go to opusa.org, call 1-800-678-7255, or mail a check to Operation USA, 3617 Hayden Ave., Suite A, Culver City, CA 90232. Oxfam America works to fight poverty and injustice by helping people in struggling areas earn a living, teaching them to save money and offering disaster risk-protection programs. Money donated to Oxfam's Haiti Earthquake Recovery Fund will go to water delivery and sanitation projects. To donate, visit OxfamAmerica.org, or call 1-800-77-Oxfam. If you would like to mail a check, send it to P.O. Box 1211, Albert Lea, MN 56007. The organization works to bring modern medical care to poor communities around the world. To donate, go to pih.org, or text GIVE to 25383 to donate $10. You can also mail a check to Partners in Health, P.O. Box 845578, Boston, MA 02284-5578; write "Haiti" in memo line. If want to donate supplies, the agency is in need of orthopedic supplies, surgical consumables (sutures, bandages, non-powdered sterile gloves, syringes, etc.) and large unopened boxes of medications. Small quantities, unused personal medications or expired supplies will not be accepted. Please fill out a form on the Web site for supply donations. The agency also needs blankets, tents and satellite phones with minutes. People with private planes willing to fly medical personnel and/or large quantities of supplies are needed. For information, call 617-432-5256. Project Hope responds to crises with medical supplies and medical volunteers, and it is committed to long-term sustainable health care. To donate, go to projecthope.org, or mail a check to 255 Carter Hall Lane, Millwood, VA 22646. Monetary donations will be used for shipments of medicine and medical supplies and for deployment of volunteer doctors and nurses to Haiti. The organization lifts people out of poverty, beginning with disaster response and ending when families can live sustainable lives. To donate to its relief effort, go to Worldconcern.org, or call 1-866-530-5433. You can also mail checks to 19303 Fremont Ave. North, Seattle, WA 98133. Please specify that the check is for "Haiti Disaster Response." Money will go toward water supplies, shelter, blankets, distribution of food and long-term needs, such as job training, education, loans and home construction. The World Health Organization is leading the health care group in Haiti, managing both the United Nations and the nonprofit groups who are trying to bring medical care to the devastated country. Its medical distribution center is giving out vaccines, medicines and other supplies that are going to systems like water sanitation, disease surveillance and hospital assessments. To donate, visit the PAHEF Web site, or call 202-974-3727. The agency trains and educates communities to solve hunger, poverty and disease. To donate, go to wn.org or call 405-752-9700, or mail a check to World Neighbors, 4127 NW 122nd St., Oklahoma City, OK, 73120; write "Haiti Fund" on the memo line. Monetary donations will be used to support short-term needs (i.e. 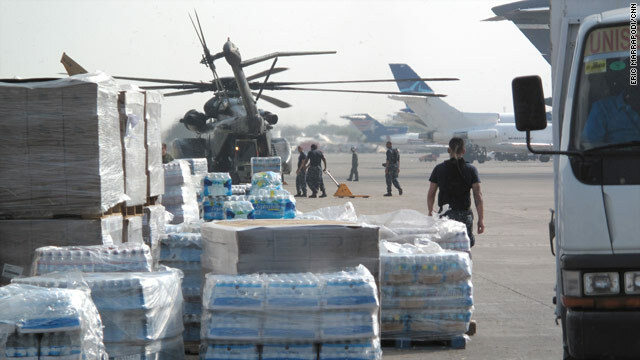 food, water and supplies) and long-term development programs. The agency's main focus is bringing clean water to developing countries. To donate, go to worldwaterrelief.org, mail checks to 8343 Roswell Road, Suite 455 Atlanta, GA 30350-2810, or call 404-242-1601 or 214-500-9417. Money will go directly to water filtration systems that will be installed in Haiti. This organization, founded by Wyclef Jean, creates projects to improve the quality of education, health, environment and community development in Haiti. To donate to to its Haiti relief efforts, go to yele.org, or text YELE to 501501 to donate $5.